A temple without a deity is likened to a body without a soul. It was natural, therefore, that it was unanimously decided to get the Temple with its Hall blessed, by installing the statues of various deities within its precincts. In the Pantheon of Hindu Gods and Goddesses, it is difficult to arrive at a proper estimation of their individual importance in the hierarchy. However, a brief explanation of the various images in the Temple, is not out of order, in this brief chronicle. Hindus believe that Brahma, the First Person of the Hindu Trinity is the Creator. The Second Person of the Hindu Trinity, Vishnu, is the Protector, and Maheshwar, the Third Person of the Hindu Trinity is believed to be the Destroyer. Most regard seems to be paid to the Second Person of the Hindu Trinity, Lord Vishnu, since He is the Protector and all of us, in our human condition, are in need of divine protection. Along with Lord Vishnu, the Goddess Shri Lakshmi appears as a symbol of power behind Him. Lord Vishnu is depicted as having four arms, one carrying “Shankha” symbolizing goodwill; another carrying “Chakra” and the third carrying “Gada” both representing the destruction of evil; and the fourth hand carrying “Padma” (Lotus) representing tranquility or contentment. The image of Shree Lakshmi Narayan on the Temple Vedi (Platform) stands as a sacred symbol of all these virtues. 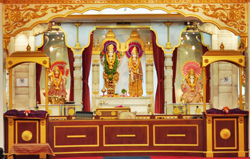 On the Vedi or Platform there are, in addition, statues of Shree Sitaram, Shree Radakrishna, Bhagvaan Buddha, Bhagvaan Shiva, Shree Durga Mata, Shree Sati Ranee, Shree Ganesh and Shree Mahavir Hanumanji. The two stone slabs fixed on the staircases depict the great sage Vashista instructing Bhagvaan Ram, an incarnation of Lord Vishnu, in the science of Yoga, and the meeting of Shree Krishna with Arjuna at Kurukshetra. The other stone slabs in the Hall depict Maharishi Valmiki, Bhagvaan Buddha, Mahamuni Vedvyas, Guru Nanakdevji, Shabri & Ram, Kewat and Shree Ram, Mahatma Bidur and Lord Krishna, Lord Krishna and Sudama, Bhagvaan Buddha’s renunciation, Gungaavatran, Sujata offering milk rice, GoswamiTulsidasji, Bhagat Surdasji, Sant Kabirdas, Mira Bai, Sant Raidas, Bhakt Narsi Mehta, Paramahans Ramkrishnan. All these images and stone slabs were imported from Jaipur in India, on the initiative of Pandit Raghunath Sharma, Mr Darshan Singh and Mr Tarlok Nath, and through the kind courtesy and co-operation of Mr Daulatram Sharma. These images were also consecratd by Mr Sharma at Jaipur in the presence of a large and distinguished gathering, prior to their being sent to Bangkok. We owe the stone slabs set on the staircases and the walls of the Temple to the philanthrophy of the late Shri Jugal Kishore Birla. He further instructed the members of the Birla Mandir to extend their fullest co¬operation in shipping and installing the stone slabs in Bangkok. The stone slabs were designed by members of the Birla Mandir. The Dev Mandir in Bangkok is blessed not only with the stone slabs depicting these sacred deities, but also with water from the sacred rivers of India, Gangatori the source of the Ganges (Ganga), Prayag (Triveni) the confluence of the rivers Ganges, Jamuna and Saraswati, Rishikesh and Hardwar, Gomati where Bhagvaan Buddha used to bathe, five Ganges in Varanashi-Gomukhi, Godavari, Pukhraj where Lord Buddha preached, Jamuna’s water from Mathura, and Sarayu’s water from Ayodhya, sacred earth from Bodhi Tirtha and from Saranath where Bhagvaan Buddha first preached. These stone slabs were airfreighted from India to Thailand, courtesy of Thai Airways International and Cathay Pacific Airways, free of any charges. In all of this, Bhikshu Shasana Rashmiplayed a significant role, particularly seeing to the consecration of the waters at Varanashi. On the 22nd of February 1969, Pandit Vidhyadhar Sukul, flew into Bangkok with these sacred relics and was greeted on arrival at Don Muang Airport by members of the Hindu Samaj, members of the Religious Affairs Department of the Royal Thai Government, representatives of the Buddhist Association of Thailand, the Young Men’s Buddhist Association, and a gathering of distinguished members of the general public. The sacred relics were received with great pomp and ceremony and carried in a decorated chariot to the premises of the Hindu Samaj. The relics were then placed on the Vedi or Platform of the Temple where a large congregation of people from all walks of life were present to pay their respects and offer their felicitations.